The Eranove Group's prime asset is its human capital, which encompasses a whole range of pan-African expertise. Thanks to high-performance employment, training and experience-sharing programs, this capital has leading edge skills which are constantly being enhanced. For the Eranove Group, the pursuit of performance for the benefit of its clients, shareholders, employees and for society, is constant and operates at several levels: economic, social, financial, technical, human, environmental and societal. At every level of the value chain, performance is measured via shared targets which form part of a continued improvement strategy. The Eranove Group has been operating in Africa, through Africa and for Africa for over 50 years. This African outlook is reflected in its managerial model, which is focused on accountability, and its social policy, characterized by mutual assistance, sharing and brotherhood. The integration of the Eranove Group in Africa ensures a close and lasting relationship with clients, partners and host communities. The Eranove Group's governance aims to ensure transparency and precision through strong, ethical and responsible bodies. Each employee develops with integrity and professionalism in accordance with local regulations, international standards and in line with ISO- and OHSAS-certified practices. By taking into account the cultural context, operational, technical, human and environmental realities at its operational locations, the Eranove Group is always able to anticipate its clients' needs and to come up with innovative, tailored solutions. Creativity is at the forefront when it comes to operations and projects, with a focus on openness and sharing of ideas. The Eranove Group is a citizen-focused company that is aware of its rights and duties vis-à-vis society and the environment. It promotes ethical behavior, which builds trust between the company and its ecosystem, helping to forge long-term business relationships. 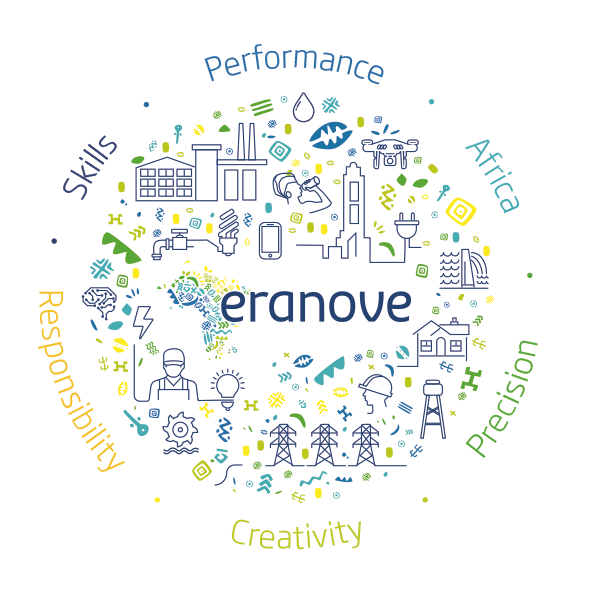 All members of the Eranove Group are committed to sharing the Group’s values, and are aware of their role vis-à-vis colleagues, stakeholders and the planet.